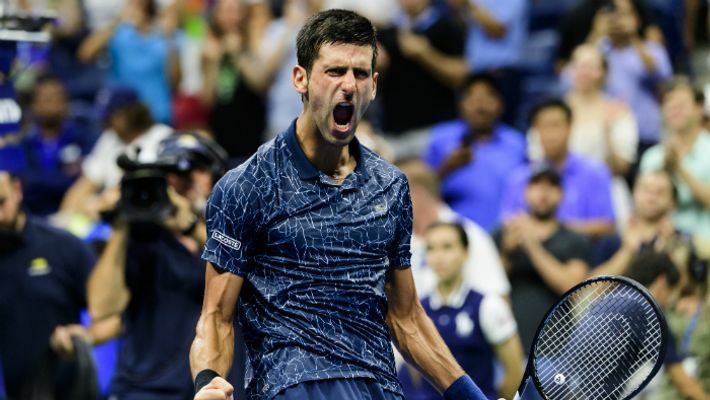 Tennis superstar Novak Djokovic has been invited by the International Cricket Council (ICC) to a net session at the Cricket World Cup 2019 in England to himself for the Wimbledon. The Serbian world no 1, who is set to play the title decider against Alexander Zverev at the ATP World Tour Finals in London, suggested a strong candidate from Team Djokovic for England cricket team coach Trevor Bayliss, via Twitter. This was before his semi-final win against Kevin Anderson. On Saturday night, Djokovic tweeted, "Imran Bashir (my chauffeur for the #NittoATPFinals) has been part of #TeamDjokovic for 10 years! He is also a famous batsman for his local #cricket team. He received this trophy for best batsman of the year and we need to get it out there!" as he posed with Bashir. Adding to the above tweet, he called out England coach Bayliss and on a fun note said, "#TrevorBayliss @englandcricket, you should keep your eye on Imran. I think he is a strong candidate for your team." Calling Bayliss, ICC replied to his tweet, "We know you try to avoid nets as a tennis player, but if you feel like mixing up your @Wimbledon preparation next year, come down and have a net session at the @cricketworldcup!" Djokovic, who will look to lift the World Tour Finals at the O2 Arena after two Grand Slam wins in 2018, was guaranteed to bag the world no 1 spot in the ATP Rankings and has the chance to end the year as the top-ranked men's player for the fifth time, with the withdrawal of Rafael Nadal from Paris Masters and the World Tour Finals. ICC Cricket World Cup 2019 will be played in England from May 30 to July 14.